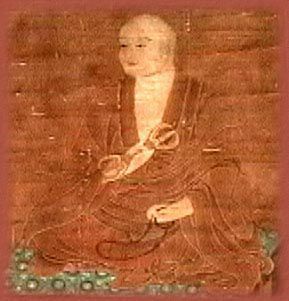 Kukai (774-835; also called Kobo Daishi) was a Japanese monk who founded the esoteric Shingon school of Buddhism. Shngon is thought to be the only form of vajrayana outside Tibetan Buddhism, and it remains one of the largest schools of Buddhism in Japan. Kukai was also a revered scholar, poet, and artist especially remembered for his calligraphy. Kukai was born into a prominent family of the province of Sanuki on the island of Shikoku. His family saw to it that the boy received an excellent education. In 791 he traveled to the Imperial University at Nara. Nara had been the capital of Japan and the center of Buddhist scholarship. At the time Kukai reached Nara, the Emperor was in the process of moving his capital to Kyoto. But Nara's Buddhist temples were still formidable, and they must have made an impression on Kukai. At some point, Kukai abandoned his formal studies and immersed himself in Buddhism. From the start, Kukai was drawn to esoteric practices, such as chanting mantras. He considered himself to be a monk but did not join any one school of Buddhism. At times he took advantage of the extensive libraries in Nara for self-directed study. At other times he isolated himself in the mountains where he could chant, undisturbed. Kukai was among these monk adventurers to travel to China. He got himself included in a diplomatic delegation that sailed in 804. In the Tang Dynasty capital of Chang'an he met the renowned teacher Hui-kuo (746-805), recognized as the Seventh Patriarch of the esoteric, or tantric, school of Chinese Buddhism. Hui-kuo was impressed by his foreign student and personally initiated Kukai into many levels of the esoteric tradition. Kukai returned to Japan in 806 as the Eighth Patriarch of the Chinese esoteric school. It so happens that another adventurer monk named Saicho (767-822) had gone to China with the same diplomatic delegation and returned before Kukai. Saicho brought the Tendai tradition to Japan, and by the time Kukai returned the new Tendai school already was finding favor at court. For a time, Kukai found himself ignored. However, the Emperor was an aficionado of calligraphy, and Kukai was one of Japan's great calligraphers. Having gained the Emperor's attention and admiration, Kukai received permission to build a great monastery and esoteric training center on Mount Koya, about 50 miles south of Kyoto. Construction began in 819. As the monastery was being built, Kukai still spent time at court, making inscriptions and performing rituals for the Emperor. He opened a school in the Eastern Temple of Kyoto that taught Buddhism and secular subjects to anyone, regardless of rank or ability to pay. Of his writing during this period, his most significant work was The Ten Stages of the Development of Mind, which he published in 830. Kukai spent most of his final years on Mount Koya, beginning in 832. He died in 835. According to legend, he had himself buried alive while in a state of deep meditation. Food offerings are left on his tomb to this day, in case he is not dead but still meditating. Kukai's Shingon teachings defy being summarized in a few words. Like most forms of tantra, the most basic practice of Shingon is identifying a particular tantric deity, usually one of the transcendent Buddhas or Bodhisattvas. (Note that the English word deity isn't quite right; the iconic beings of Shingon are not considered to be gods. To begin, in Kukai's time, the initiate stood over a mandala, a sacred map of the cosmos, and dropped a flower. As the different parts of the mandala were associated with different deities, the position of the flower on the mandala revealed which one would be the initiate's guide and protector. Through visualizations and rituals, the student would come to recognize his deity as a manifestation of his own Buddha Nature. Shingon also holds that all written texts are imperfect and provisional. For this reason, many teachings of Shingon have not been written, but can only be received directly from a teacher. Vairocana Buddha has a prominent place in Kukai's teaching. To Kukai, Vairocana not only emanated the many buddhas from his own being; he also emanated all of reality from his own being. Therefore, nature itself is an expression of Vairocana's teaching in the world.